With January coming to an end, its time to start off the next month in 2019 with a bang! 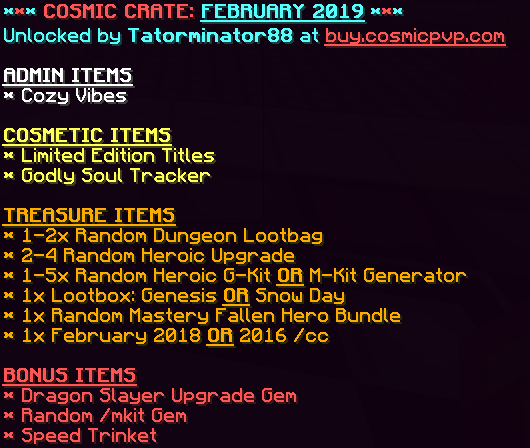 Get your factions together and enjoy what the Cosmic team has brought for you this week! 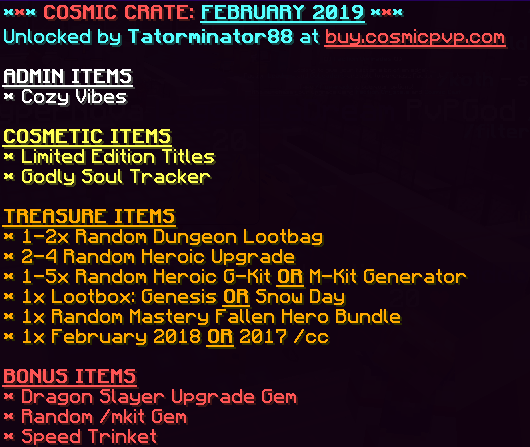 There's no way Cosmic has a /cc coming out on the first day of the month! What? Can it be? Starting your first weekend in February with the first /cc to include those Lootboxes everyone loves! Monopoly mask glitch fixed - Players that had holy white scroll gear and were put in combat by someone wearing a monopoly mask could log and when their npc was killed would never drop their gear. Core chunk bug fixed - When a core chunk was moved by an admin those claims would not disappear after the 24 hour limit. /suicide & /back - Players can no longer /suicide or /killme and then go to spawn, leave faction, create an enemy faction, and then go back to their deathpoint to inside a base. You may have noticed some extra reboots during the last couple of days on your planets. The devs are working hard on some new streamlining and optimizations that we're hoping will make things a lot more smooth for you! They have had to test on live planets as these types of optimizations requires a substantial player amount on the server. We appreciate the patience you all have shown! Thanks! Kicking off the first weekend in February with a solid 35% Off all packages at the Server Store!